How you contact your bike is crucial to your comfort, safety, and control. The three main contact points are the handlebars, seat, and pedals. This month’s shop tip will cover different types of pedals, their best use, pros/cons of each, and, for the true bike shop experience, my completely biased opinion. Best use – Town bikes, cruisers, or shorter commutes (under 10 miles one way). Pros – They are easy to use and you don’t need special shoes. Cons – Depending on the pedal, they can be hard on shoes, shins, and door jams. Some models can be slippery. These are by far the easiest to deal with – just put your foot on them and ride. There are, however, a few different styles out there to choose from. Some platform pedals work great without toe clips, while others require them. 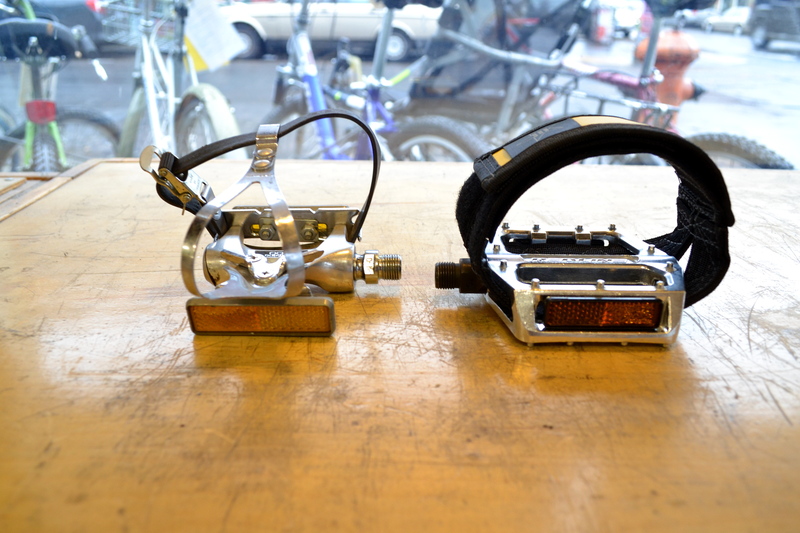 If you don’t want toe clips, find a pedal that’s grippy on both sides, such as Redline or Odyssey BMX pedals or the Lambda, Sylvan Touring, and Stream pedals from MKS. BMX style pedals are the grippiest and most supportive, with the largest platform area. They can be hard on your shins, shoes, and/or any door frames you walk the bike through. If you change to a wider pedal be careful of pedal clearance in the turns. My completely biased opinion – They’re great! Platforms pedals are simple to use and you can wear any shoes you want. I prefer a big BMX pedal with grippy pins. My feet don’t slide around or slip off, even in boots. You’re not limited to where you can put your foot, so you naturally put it in the most comfortable spot. Cons – They can be difficult to get in and out of, especially if your commute has frequent stops. You can catch things or damage the pedal if you ride on the back (non-clip) side. They don’t work well with big shoes. Toe clips and straps also come in many varieties, but there are two basic styles; those that need a clip (the cage that covers your toes), and those that don’t. Both do more to keep your foot in place on rough roads or slippery pedals, than make you pedal more efficiently. 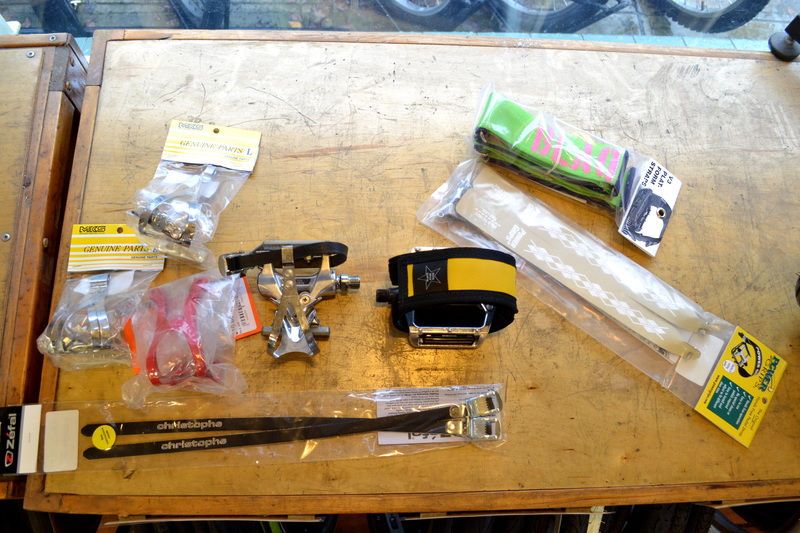 Power Grips, Blaq Design Ltd Straps, or Black Star Bags Straps work great without toe clips and can fit on most pedals, but are best on BMX platforms. 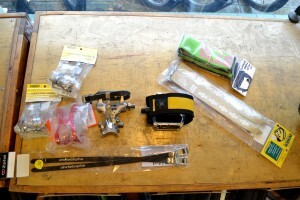 Pedals such as the Sylvan Road and Track pedals from MKS are designed for clips and straps. MKS also makes nice metal toe clips in several sizes, so finding the right one for your shoe size is easy. The pedals have a little flip tab to make it easier to get your foot in, and are one sided. Riding on the back of these pedals will knock out the dust cap, causing them to wear out prematurely. My completely biased opinion– I don’t like toe clips or straps. I never found the slide out the back motion to be intuitive. I rode them for years, even on mountain bikes, but found them difficult to get in and out of in technical situations or stop and go city traffic. I don’t think they add much security or pedal efficiency unless you pull them so tight you can’t easily slide your foot in. Cons – They require special shoes (don’t ride them without the special shoes) that can be hard to walk in. They can have a rough learning curve (you will fall over at least once). Clipless pedals (often referred to as ‘clip in’ pedals) are those funny little pedals that take a special shoe. The shoe will have a cleat bolted to it that physically locks into the pedal. To get out, you simply swing your heel away from the bike. Once you’re used to them, you stop worrying about getting stuck in them and appreciate the extra security. 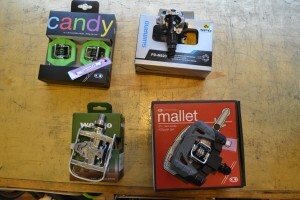 There are two basic styles of clipless pedals, road and mountain, with many different varieties. 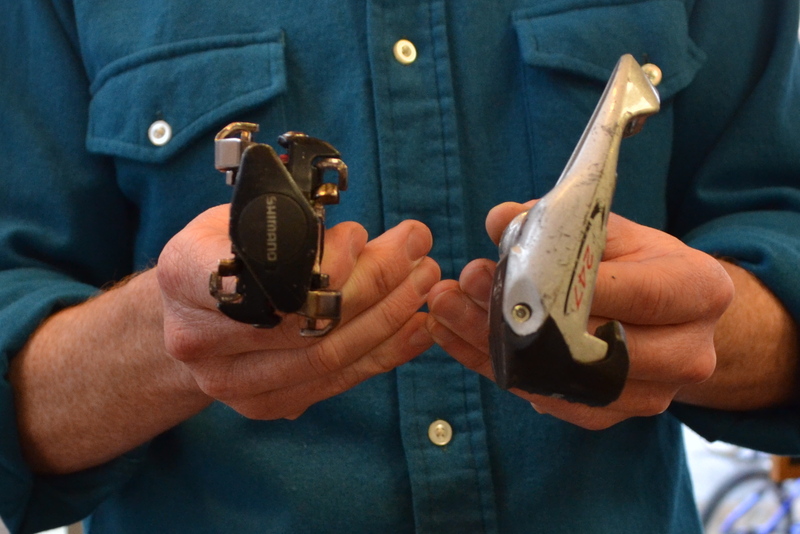 Road pedals are one sided and most use a large cleat. Since road racers don’t have to walk anywhere, road shoes are smooth soled with big cleats. This makes them very difficult to walk in. Road shoes and pedals are best suited for road racing or fast leisure riding. Because they’re one sided, they can be tricky to get into. They’re not the greatest commuting option. 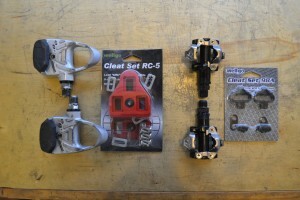 Mountain pedals are two sided and use a small recessed cleat. Mountain shoes have tread blocks surrounding the cleat, making them easier to walk in. Two sides make it much easier to click into. 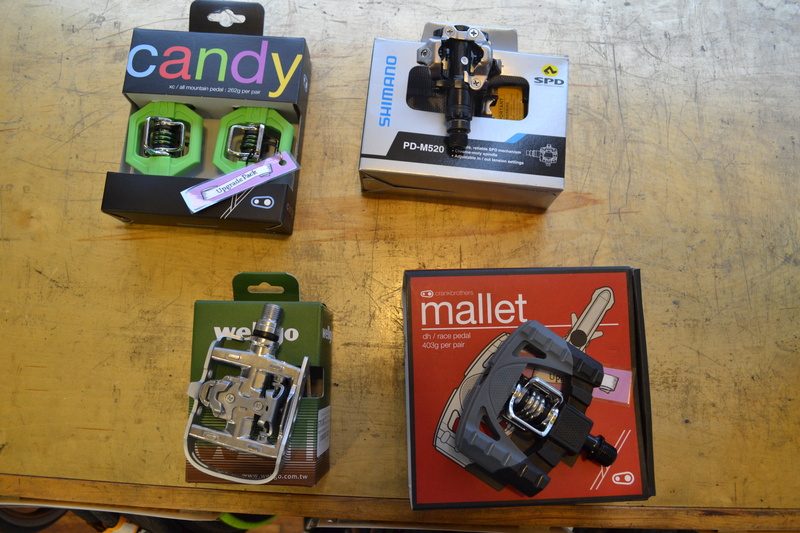 We stock a selection of Crank Brothers pedals, some with an extra platform around them, that are really easy to use. 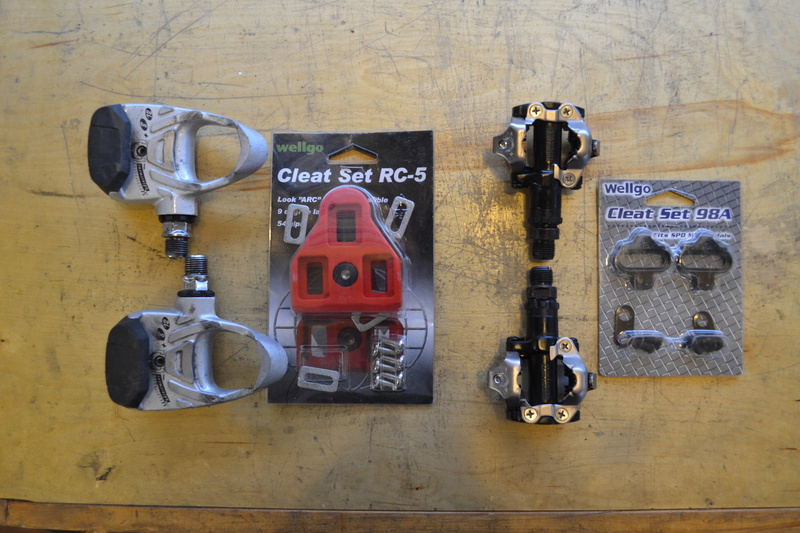 We also have pedals from Wellgo that have a platform on one side and clipless on the other. 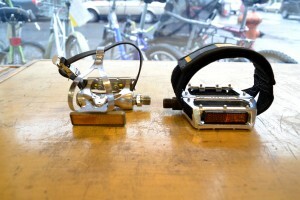 If your ‘go fast bike’ and ‘commuter bike’ are the same bike, clipless pedals can be a good option. If you don’t want to carry normal shoes with you, you can leave a pair at your workplace. My completely biased opinion – I really like clipless pedals (Shimano are my favorite), especially on my mountain bike or riding uphill. I like mountain pedals better than road. I found road cleats wore out fast and were awkward to walk in. Mountain pedals on a road bike work just fine. I don’t like them on commuter bikes because of the special shoes. Part of my dislike for toe clips and straps is that they are a much different motion to get in and out of than clipless. If you have multiple bikes, big platform pedals on the commuter and clipless pedals on your speedy bike compliment each other nicely. As you can see, there are a lot of options and opinions out there for pedals. 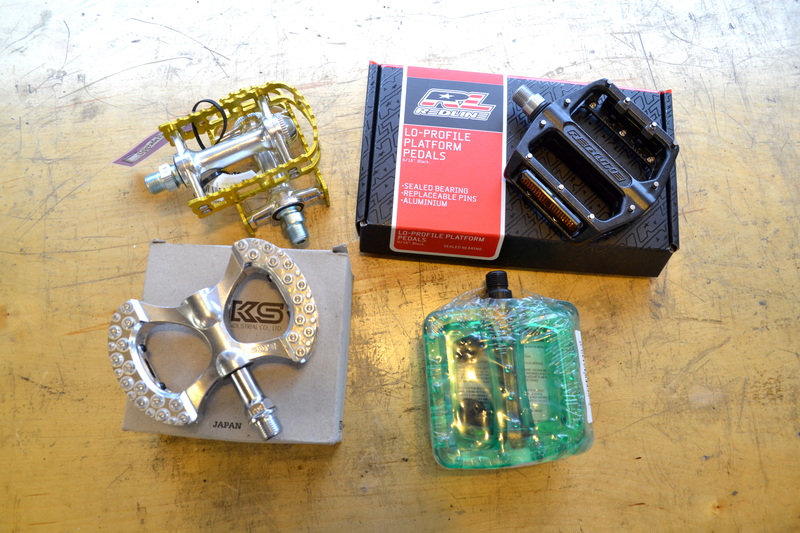 If you are not sure which pedal is right for you, want to see what we carry, or get more completely biased opinions, come to the bike shop and speak to our friendly mechanics. All of these pedals are available as part of our Upgrade Pack.